We may have hit a wall in interest rate increases, (at least for the time being) but that hasn’t stopped consumers or businesses from taking advantage of rate hikes we have seen. From December 2016 through December 2018, the Federal Reserve raised the target Fed Funds rate by 2 percentage points. CD rates have responded in kind. 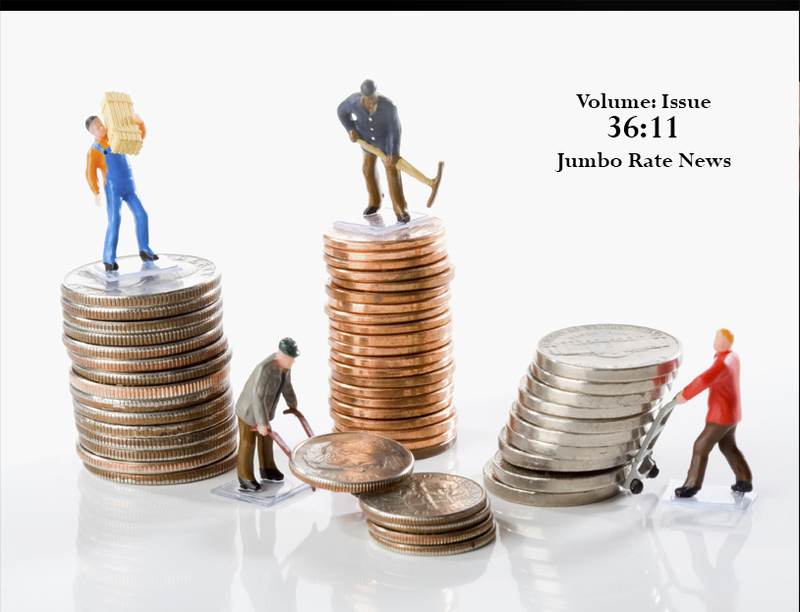 For example, the top 1 year Jumbo CD rate listed in JRN has gone from 1.25% at year-end 2016 to the 2.80% that you see here today. Organic deposit growth is a very welcome by-product, particularly when those deposits can be used to fund loans at even higher interest rates. Organic deposit growth takes time, though. 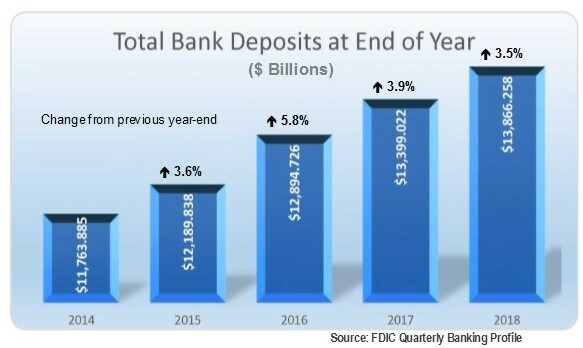 As you can see from this chart, annual deposit growth at all U.S. banks has been ranging from about 3½% to just under 6% (5.8%) over the past few years. Conversely, the 50 community banks listed on page 7 grew their deposits more than 56% (in some cases much more) during calendar 2018. In most cases, this growth was achieved with an acquisition. For example, Legacy Bank & Trust, Rogersville, MO (listed last) ended 2017 with just $168 million in assets and $138 million in deposits. In February, it acquired First National Bank, Clinton, MO. This transaction added $76 million in assets and $$69 million in deposits. Most importantly, however, it added three new branch locations from which Legacy could continue its growth efforts. Today, let’s focus on 4-Star M1 Bank, Macks Creek, MO. Veteran banker, Ken Poteet, had a vision to create a “mission/purpose-driven” bank. To do so, in July 2017 he created a bank holding company, M1 Bancshares, based out of St. Louis. The second step, in January 2018, was to acquire Bank of Macks Creek, MO, a $30 million community bank that he rebranded and molded into what it is today. Last November the community joined Poteet in a ribbon cutting ceremony for its second branch in Clayton, MO. While it just has the two branches, M1 considers itself a national brand, and as such, is dedicated to affordable housing and renewable energy on a national scale. Ken Poteet founded Sterling Bank, Poplar Bluff, MO back in 2004. He resigned in 2016 after Sterling had amassed more than $1.2 billion in assets through 11 branches. With more than 30 years of banking experience and contacts, he has reportedly partnered with developers to finance over $3 billion in related projects in 30 states…so far. Helping Hand-Me-Downs (helps to clothe, feed and support children and families). The list will undoubtedly continue to grow as the community’s needs change and the bank’s reach continues to grow.